If you've ever lived with anxiety, fear, and emotional pain, you know how much they diminish your life. But life can change, when you change your thoughts, words, and actions. What holds us back from sane aging? Living in the past - a negative outlook - a victim mentality - resentment and anger - chronic complaining - fear. By choosing to change our attitude and take proactive action, we can cut ourselves loose from this emotional baggage. What moves us forward into aging sanely? Living for today - a positive outlook - taking responsibility - building self-confidence and inner strength - living on purpose - building a community of family and friends. With humor and honesty, author Camille Goscicki uses her personal experiences to illustrate how to age well, mentally and emotionally. In section one, she describes how to cultivate those personal qualities that lead to a sane life: self-acceptance, self-confidence, resilience, among others. In section two, she talks about those qualities that enhance your relationships: forgiveness, kindness, friendship, and more. Any woman can age sanely. 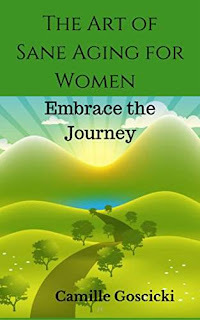 Let The Art of Sane Aging for Women help you take that first step.